Interlok can both receive emails via POP3 and IMAP and send emails via SMTP as part of its standard feature set. This guide will show you how to use Interlok to interact with a mail server using these protocols. 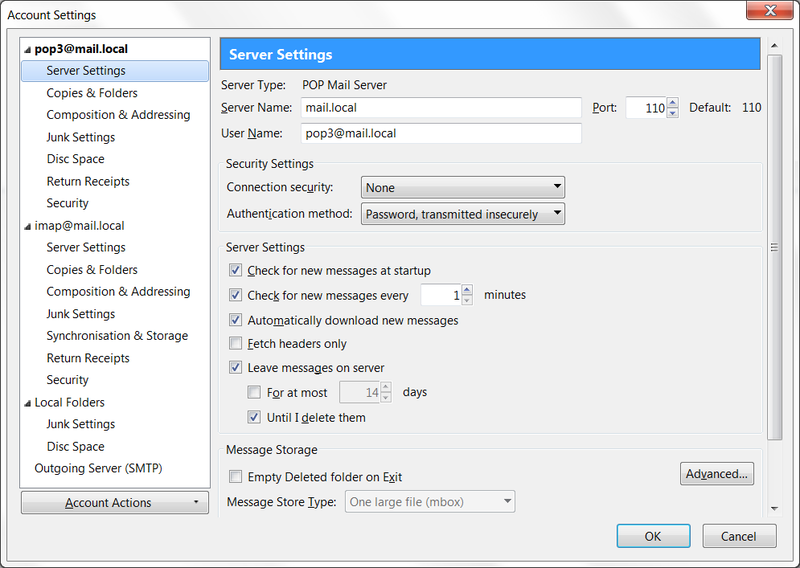 Receiving emails is done by using a message consumer that is configured for POP3 or IMAP. Sending emails is done by using a message producer that is configured for SMTP. 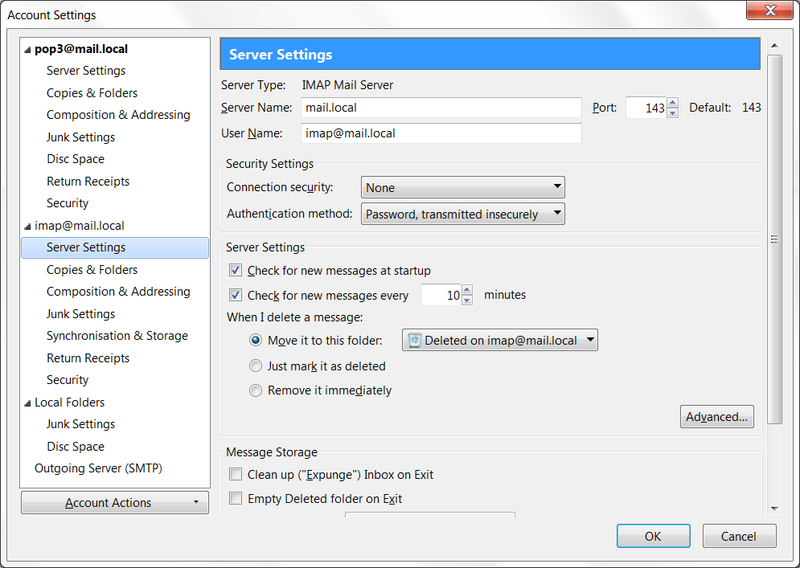 The worked examples used in this guide all refer to a locally running mail server that has been configured for this exercise. See the instructions at the end for how you can set up your very own mail server with a corresponding configuration. To keep the examples simple, all workflows are a combination of a mail consumer with a fs-producer or of a fs-consumer with a mail producer. Throughout this guide you will find examples with snippets of adapter configuration, which are all taken from the whole configuration file adapter.xml. Neither of the mail consumers and producers need a connection definition in the channel, so a null-connection can be used. The mail server connection details are all configured in the consumer and producer. Note that JavaMail session properties can be set in addition to the Interlok-specific features that this guide highlights. Please see the the official Java documentation for the POP3, IMAP and SMTP session properties. raw-mail-consumer, which processes emails raw as they are and therefore does not interpret attachments. default-mail-consumer, which can interpret emails with attachments. Both consumers are configured with a number of properties, which are introduced in the following sub-sections, followed by some worked examples. The default-mail-consumer supports all of these properties, whereas the raw-mail-consumer only supports the subset that is not related to dealing with parts. The differences are mentioned where appropriate. To start though, the following is an overview of some of the key differences. Each consumer outputs different internal Interlok messages depending on whether a multi-part email (i.e. an email with attachments) is being processed. For the default-mail-consumer the behaviour differs further depending on whether it has a part-selector set (see the corresponding section for details). Also see the documentation available for mail-consumer-imp, from which both consumers inherit shared functionality. Interlok only ever consumes emails that are neither marked as read nor as deleted. Interlok marks each email consumed as read (however, oddly, with Sun’s JavaMail implementation this only has an impact when using IMAP but not POP3). The combination of the above means that when using IMAP with Sun’s JavaMail implementation and even when not deleting consumed emails then Interlok will only consume new emails every time it queries the server. In turn, when using POP3 with Sun’s JavaMail implementation this means that the only way to only consume new emails is to delete previously consumed ones. See the mail receiver factory property for using another implementation for POP3, as well as the delete on receive property. Note: For more information on how to configure the destination and filters please see mail-consumer-imp, which includes how to put together the destination path, specifically the mailbox at the end of the URL. Note that user name and password can also be set via the dedicated corresponding properties username and password directly on the consumer, which will then allow having them encrypted in the XML. It is also possible to define an optional filter expression, which is a comma-separated list in which filters for FROM, SUBJECT and RECIPIENT may be defined (in any order, the keys are case-insensitive). The actual type of the expressions is defined by the regular-expression-style property of the consumer (i.e. not within the configured-consume-destination, but on the same level as it). Values may be GLOB (default if omitted), AWK or PERL5 . The mail consumer doesn’t actually receive mails itself, but relies on a configurable mail receiver, which allows for more flexibility. This is done by configuring the consumer with a mail-receiver-factory, which in turn will provide the consumer with a receiver. There are various flavours of receiver factories, each corresponding to a specific type of receiver. Typically, javamail-receiver-factory will meet all needs, but pop3-receiver-factory and pop3s-receiver-factory are also available. The sample below shows how to enable TLS for POP3 connections (see POP3 Javadocs for details on session properties). The consumer can be instructed to delete emails that it has received. This is done by setting the property delete-on-receive to true (by default this is false). Whether a part-selector is set has a fundamental impact on how the default-mail-consumer processes emails, as is outlined in the overview table above. non-multi-part email (i.e. an email without attachments) then the consumer will output a single internal Interlok message containing the email’s content (i.e. the body). multi-part email (i.e. an email with a body and at least one attachment) then the consumer will output several separate internal Interlok messages, one for the body and one per attachment. These internal messages will then subsequently all be processed individually as per the adapter config. non-multi-part email then the consumer will not output any message, because no part is present that could be selected. multi-part email then the consumer ignores all parts that the part-selector did not select. In practice this can be used to only keep the body (the selected part) and ignore all attachments or for example to always select a specific attachment. If the optional property preserve-headers is set to true on the default-mail-consumer then all the headers from the consumed email are preserved as metadata in the internal Interlok message. Each header can optionally be prefixed with the value specfied by the optional header-prefix property. produce a received email to the local file system, using the file name format %2$tF-%2$tH%2$tM_%1$s, which is the date and time followed by the message ID (e.g. 2016-02-17-1814_5c3f6c67-9b80-429c-9dee-f40df360664c). These files are MIME-encoded text files, so they are a full representation of what the internal Interlok messages look like when output by a mail consumer and then further processed by services and producers. These files can give you an idea of what payload and metadata to expect in practice. The following emails are used as sample inputs in all examples further below. I am the body of an email without attachments. I am the body of an email with two attachments. This example produces a received email to a single MIME-encoded file, which contains a raw copy of the email, including any attachments if present. The two sub-sections illustrate the behaviour of this consumer depending on whether a part-selector is set. Notice how in all examples the original mail headers are preserved in the metadata and prefixed with MailHeader-. This example has no part-selector set, which means that the consumer will output one message for each part of an email. I am text file number one. I am text file number two. This example uses select-by-position as the part-selector to select the first part of a multi-part email as the body part, which ignores all other message parts, assuming they are attachments. The sample email with one part produces no file. default-smtp-producer, which can send emails with no or with a single attachment. multi-attachment-smtp-producer, which can send emails with multiple attachments. Both producers are able to send via SMTP and SMTPS simply by using the corresponding protocol, for example smtp://mail.local:25 or smtps://mail.local:465.
delete the consumed file as soon as it’s picked up. 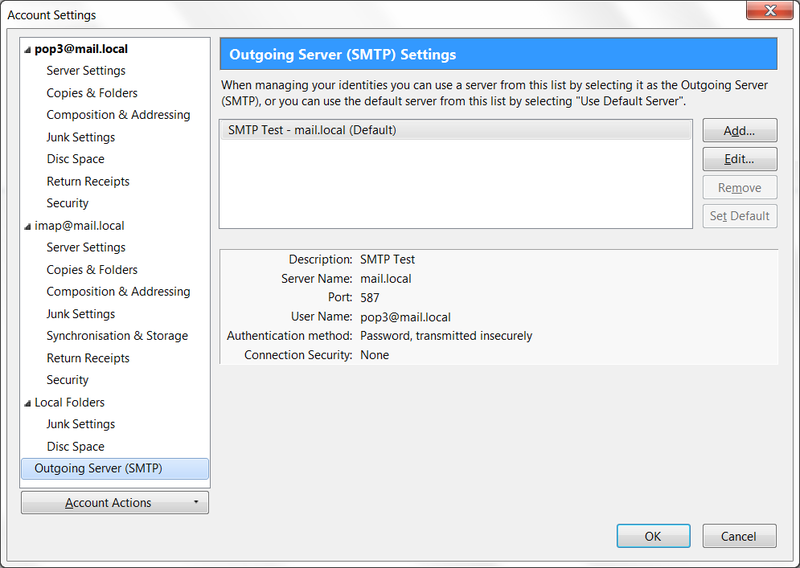 This section contains examples using the default-smtp-producer. In all these examples the add-metadata-service is used to set a subject that differs from the default subject that is defined in the producer. Since the subject is a metadata item on the message, this simple configuration could be taken further by constructing the metadata value in a more complex way than just having it hard-coded in the workflow. See the documentation for further metadata items that the producer can interpret, such as setting a CC list. Below is an example which reads any given text file from a local directory and sends its content as the body of an email. Subject: This just in: Test email from Interlok! Below is an example which reads any given text file file from a local directory and sends it as an attachment of an email. In contrast to the example without attachment, the body of the mail is now set using an additional metadata item. This is because the file is now an attachment and not used as the body. By default, the name of the attachment is the message’s unique ID, so not necessarily useful. The name can be set explicitly using the metadata key emailattachmentfilename. So this can be a hard-coded value, one that is constructed in a more complex way or simply the actual file name. The latter is done by using a copy-metadata-service to copy the original name from the metadata key originalname, which was set by the fs-consumer when it read the file. This is the approach taken in this example. with a single attached file that has the same name as the file that was picked up. Subject: This just in: Test email from Interlok with attachment! 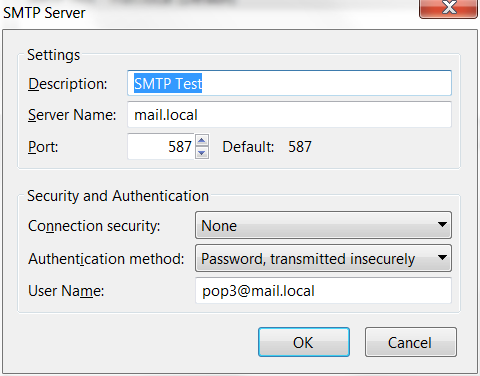 This section contains examples using the multi-attachment-smtp-producer. There are different ways this producer can be used depending on which implementation of mail-content-creator is used. Currently, there is one implementation to create mails with multiple attachments from a MIME multi-part message and another implementation to do the same from a simple message with XML content. The implementation to be used is set as the mail-creator property on the producer. The sub-sections below show how to use both of these creators. Also see the documentation of multi-attachment-smtp-producer for general metadata items that the producer can interpret, such as setting a subject or a CC list. Below is an example which reads a MIME multi-part message from a file in a local directory. This is simply a text file that has a certain format, see below for a sample input file. However, this MIME multi-part message may also be created in other ways than using the fs-consumer. Using the mime-mail-creator allows using one part of the message as the body, while all other parts become attachments. There are various ways to select the body part. The mime-mail-creator has to be configured with the desired implementation of a part-selector. The example below uses select-by-position, but it is for example also possible to use select-by-content-id or select-by-header. with two attachments, whose names are taken from the Content-Type/Content-Disposition headers of the respective parts. Below is an example which reads a local XML file. The format of this file is flexible, it simply has to contain a node that contains the body and it can additionally contain several attachments in the same file in other nodes (each attachment needs to have the same format, but the format itself is not prescribed). See below for a sample input file. Using the xml-mail-creator requires configuring a body-handler and an attachment-handler. The configuration of these handlers then describes how to extract the body and how to extract any attachments from the XML. For both handlers there is currently one implementation each, the aptly named xml-body-handler and xml-attachment-handler. Both handlers have a mandatory property called xpath, which contains the path to the node that contains the respective data. For the body, the result of this XPath should only be a single node containing the body text, whereas for attachments the result can be zero to many nodes. In both cases, this XPath is evaluted as an absolute path from the root of the document. Both handlers also have the optional property encoding-xpath, which is typically more useful for attachments as they may likely be base64-encoded, rather than plain text. For the body, this XPath is evaluted from the root of the document, whereas for attachments it is evaluated from the path of the attachment node. This allows each attachment to be encoded differently. Additionally, only the xml-attachment-handler has the optional property filename-xpath, which is evaluated from the path of the attachment node, just like encoding-xpath. This allows each attachment to be given a different file name. with two attachments, both found as the nodes /document/attachment, their names taken from the respective relative XPath @filename and their encoding from @encoding. This section contains instructions on how to set up a local email test server as well as an email test client in the same way that it was used to create the examples shown throughout this guide. Note that the instructions are for Windows only. To set up an email server we will create both a unique host name that is only valid on the local machine as well as an actual email server that will be configured against that host name. This will give you a domain name that is only accessible on your local machine and that a locally installed mail server and clients can be set up against for testing. For Windows download and install hMailServer, which is a free POP3, IMAP and SMTP server that is straightforward to set up. Once installed, start the hMailServer Administrator application and log into the administrator account that you created during installation. In the Domains panel add a new domain called mail.local (must be the same domain name used in the hosts file). Open the new domain item and create two new accounts, one for testing POP3 and one for testing IMAP. Either may later be used to test SMTP. As addresses enter pop3 and imap respectively, making sure to enter a password for both. For simplicity’s sake use the password test. These two accounts will now be available as the email addresses pop3@mail.local and imap@mail.local. The full email address acts as the user name when configuring connections to the mail server. Nothing else needs to be configured now, the defaults are all good as they are. 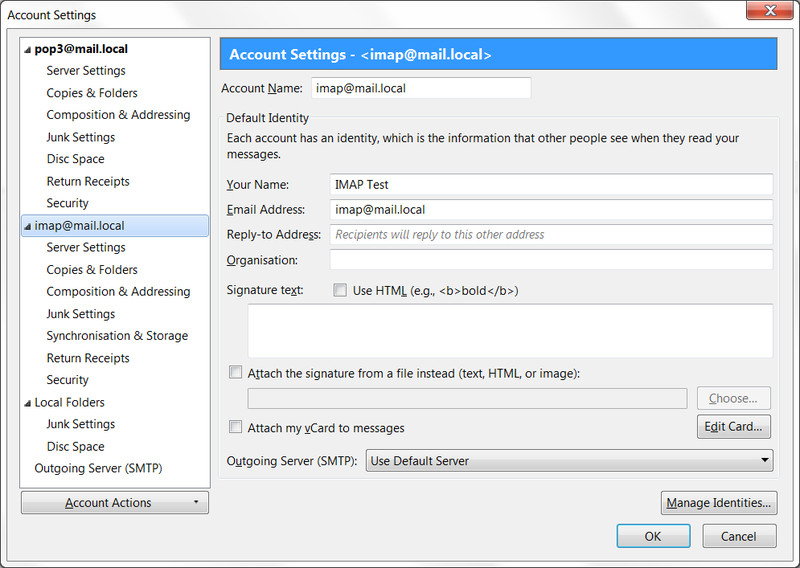 It is now possible to send mails using the host mail.local as a POP3, IMAP and SMTP server with the accounts pop3@mail.local and imap@mail.local. Thunderbird is a free email client. It can struggle a little when displaying emails with attachments (some but not all attachments may be shown inline in the body instead of actual attachments), however viewing the raw email works perfectly (View menu – Message Source). Outlook is an alternative that hasn’t exhibited this behaviour, so if it is available to you it may be a better choice. Below are some screenshots that indicate how Thunderbird was configured. 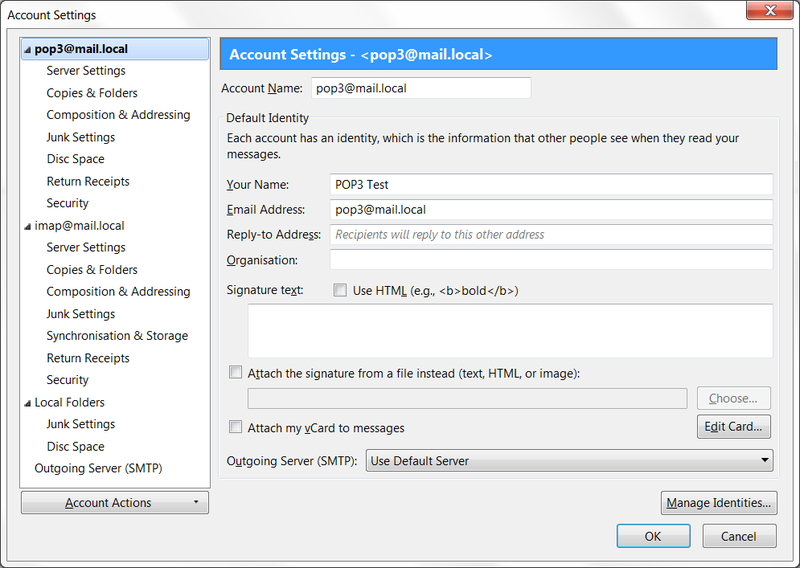 Below is a Java class that can be used to verify the contents of POP3 and IMAP accounts. This is useful if during testing you find that the messages that Interlok seems to see and consume differs from what you can see in your desktop email client. This is especially true for POP3 as deleting emails using a desktop client after having fetched them from the server may not be immediately reflected on the server, i.e. what you see in your local mail client may be different from what is actually on the server. This Java class however will always give you a fresh and raw view of the actual contents of any POP3 or IMAP folder. Plus, it won’t fiddle with emails’ flags such as marking them as seen; it is completely non-invasive. To run it you will need to have javax.mail.jar on the classpath.